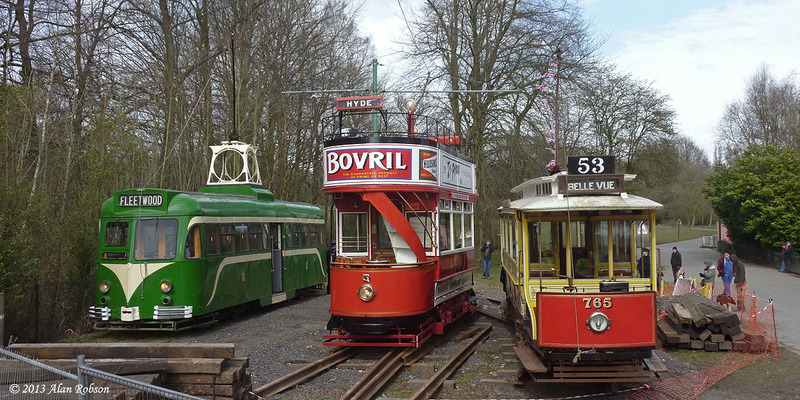 The lease for the land where the new Heaton Park Tramway depot is to be constructed was finally signed today. 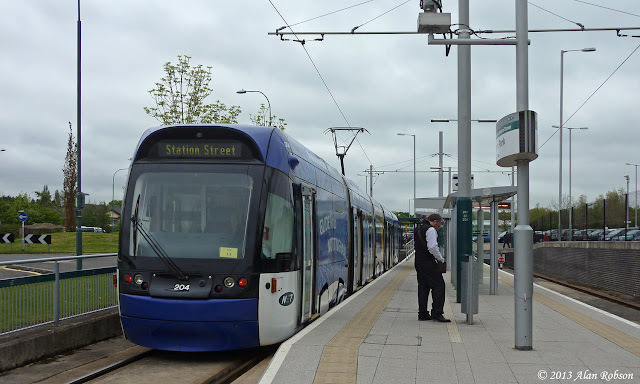 This has been a long protracted process because it is public land where the new depot is to be built. Representatives of the Manchester Tramway Company and the Manchester Transport Museum Society signed the lease with Manchester City Council earlier today. 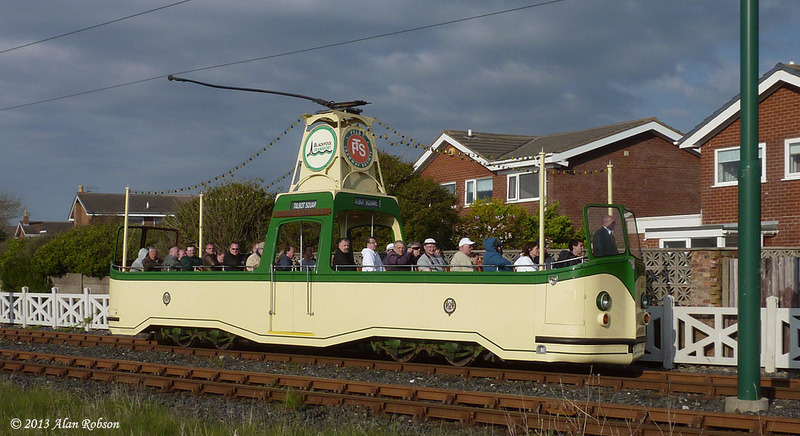 This clears the way for the actual construction of the new Lakeside depot to begin in the not too distant future. 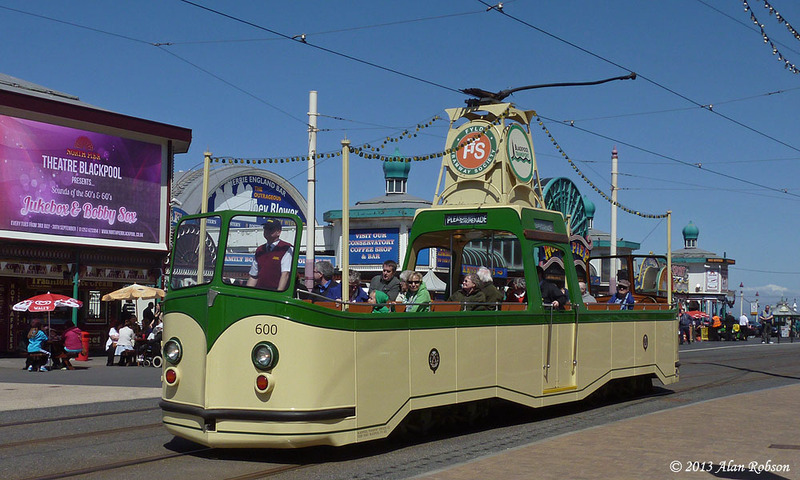 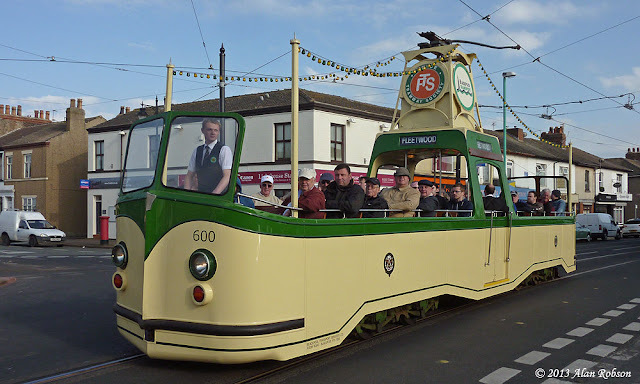 Sunday 26th May saw another excellent day of heritage running on the tramway in Blackpool, with no less than eight of the traditional tram fleet seeing use at some point during the days proceedings. 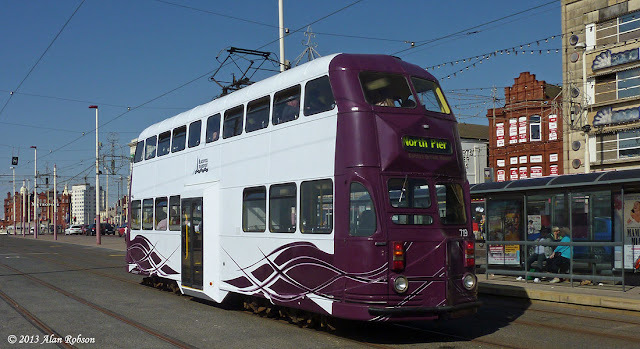 The day started out overcast and grey for the first heritage run to Fleetwood and ended up cloudy for the late afternoon heritage outing to Fleetwood, but in between the first and last trips the sun shone unrelentingly all day in Blackpool. 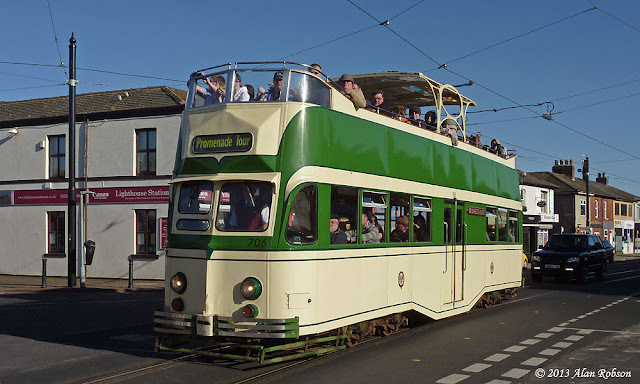 Centenary car 642 was the first tram out on the Heritage Tour, making the by now customary run to Fleetwood and back, with a full standing load. 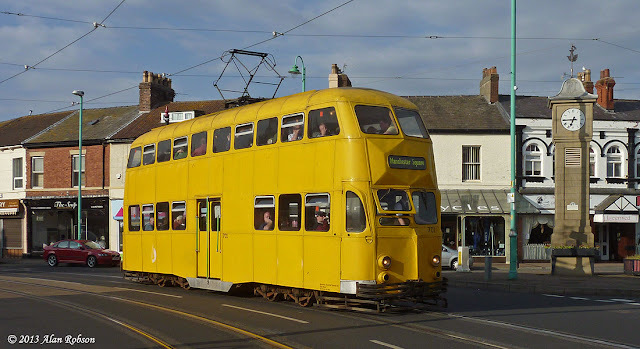 The second heritage car out was Balloon 723, which had been the standby snowplough during the winter, and widened Balloons 707 and 713 were in use on specials. 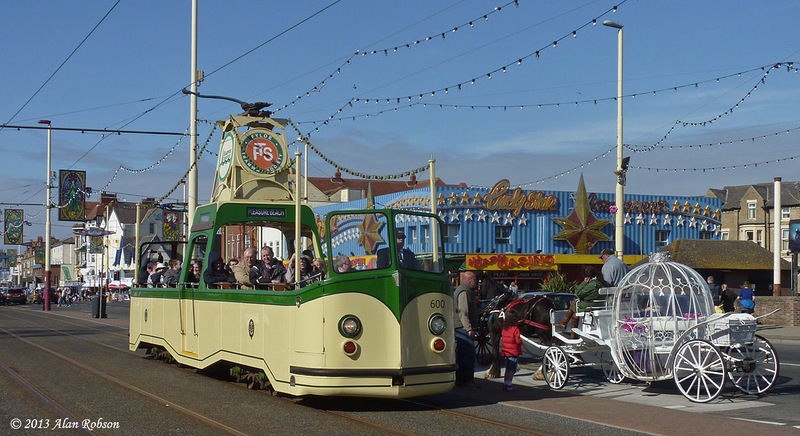 Balloon 723 was swapped for Boat car 230 in the early afternoon due to the sunny weather. 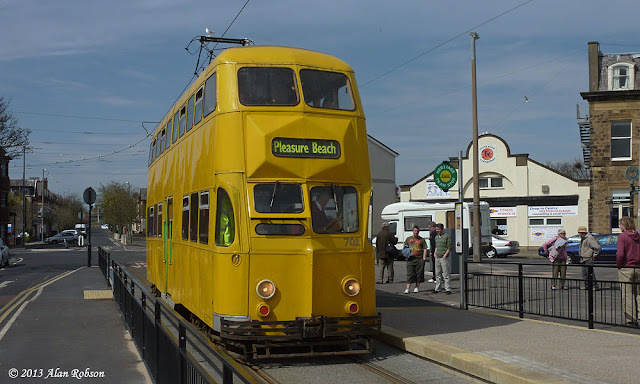 There were problems at the Pleasure Beach shortly after, when Centenary 642 decided to give up the ghost just after it had departed the loop for a run to Bispham. The tram had ground to a halt on the northbound running line alongside the inspectors hut, having suffered a burnt out traction motor. The problem required the fitters to be called out from the depot, in the meantime northbound service trams were held up and Boat car 230 was imprisoned on the Pleasure Beach loop, being unable to exit until 642 had been moved. 642 eventually made it back to the depot under its own power, although this had put paid to the planned pairing of the two yellow trams 701 and 642 for the final heritage run to Fleetwood. 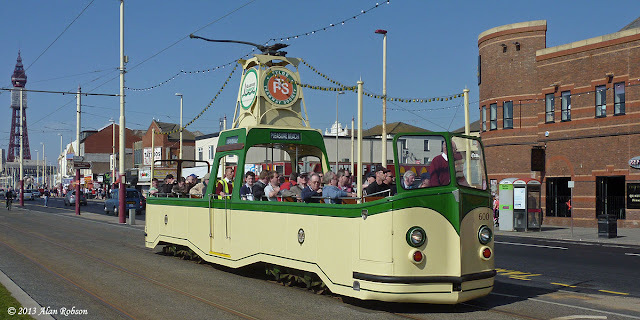 The crew of 642 re-entered service later with Boat car 600, also flat fronted Balloon 707 was swapped for open-top Balloon 706 Princess Alice at 16:00. 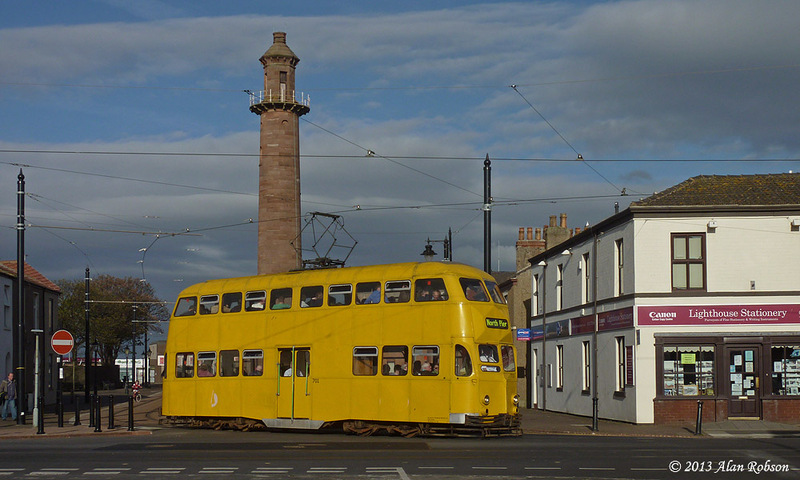 Another tram failure, with 230 suffering a compressor fault, meant the early withdrawal from service of this tram, to be replaced with yellow Balloon 701 which emerged from Rigby Road depot at 17:05, just in time to take part in the final heritage run of the day to Fleetwood, with Boat 600 acting as a duplicate on this run. The weather on the Bank Holiday Monday began to deteriorate rapidly by mid-morning, with solid grey cloud and rain setting in for the remainder of the day, making this a good day to ride the trams but much less successful from a photography point of view. Classic Bus North West held their heritage running day on Saturday 25th May on the Catch 22 bus service that runs from Mereside in Blackpool through to Cleveleys. 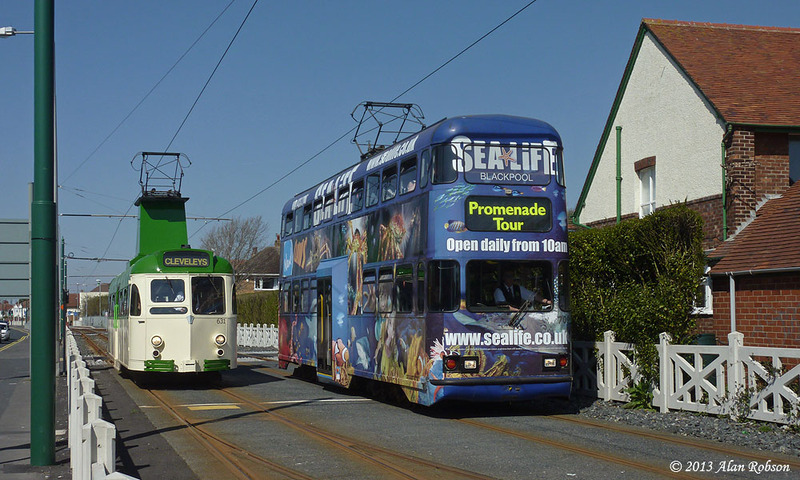 Buses in use during the day were 1968 Blackpool Leyland PD3 No 529, 1946 Lytham St Annes Leyland PD1 No 19 and CBNW former London Transport AEC Routemaster RM 1568, the other buses on the 22 during the day were the usual Dennis Darts that are used on the service. 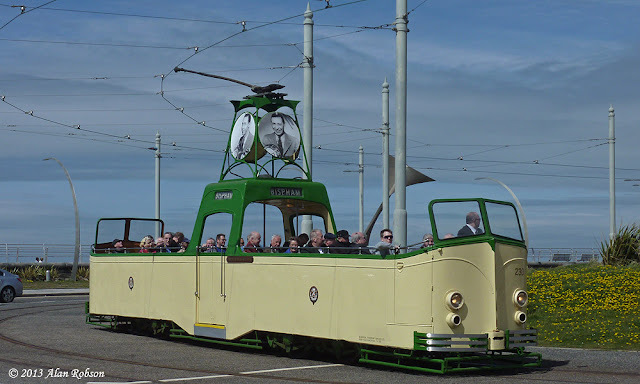 Saturday 25th May saw the start of another three days of Heritage Tours and Balloon specials in Blackpool. 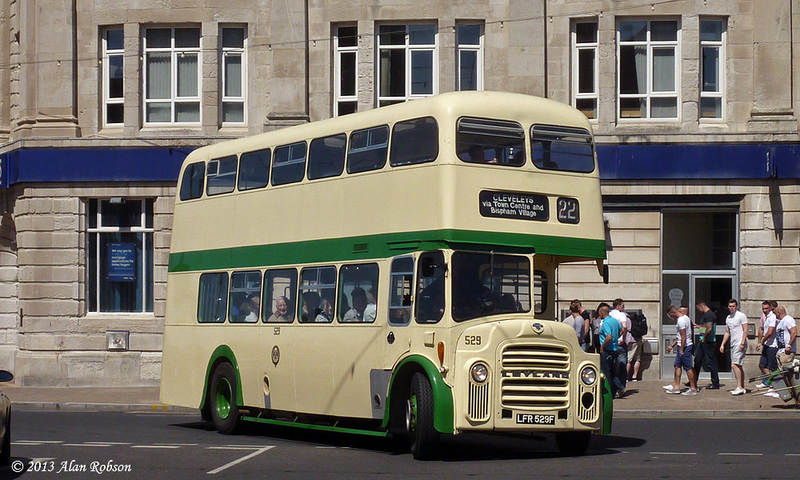 The star of the show was intended to have been Centenary 648, which was due to have been given an earlier look and feel, by the removal of the advert boards and the receipt of a green and cream paint job. 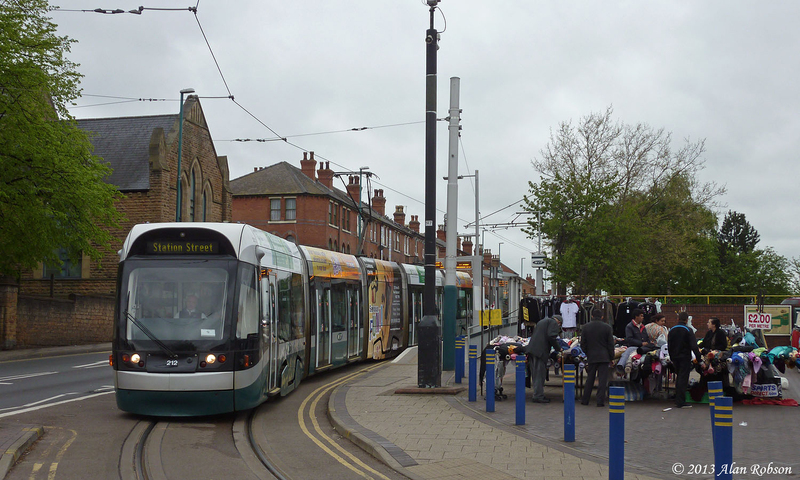 In the event the amount of work that needed doing to 648 meant the tram was not going to be completed in time for the weekend, and Bolton 66 was used as a substitute instead. 648 was displayed on Hopton Road in the afternoon, so that enthusiasts could see the progress of the work so far. 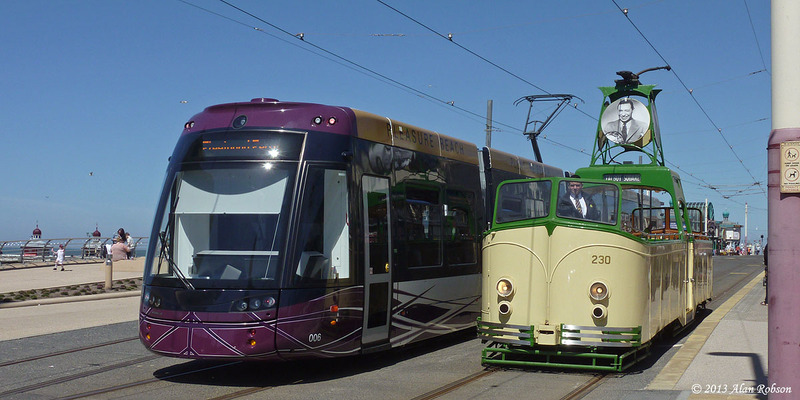 Other trams in service during the weekend were 706 Princess Alice, Boats 230 and 600 and widened Balloons 711, 719 and 700. 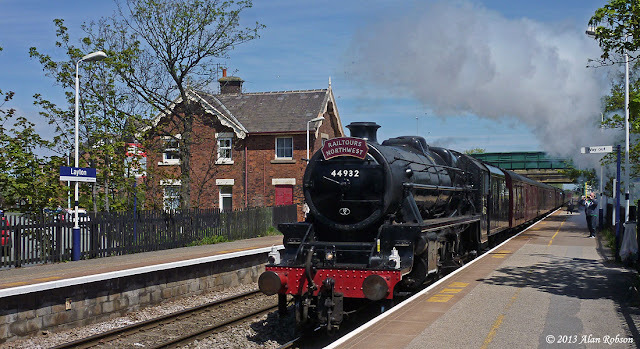 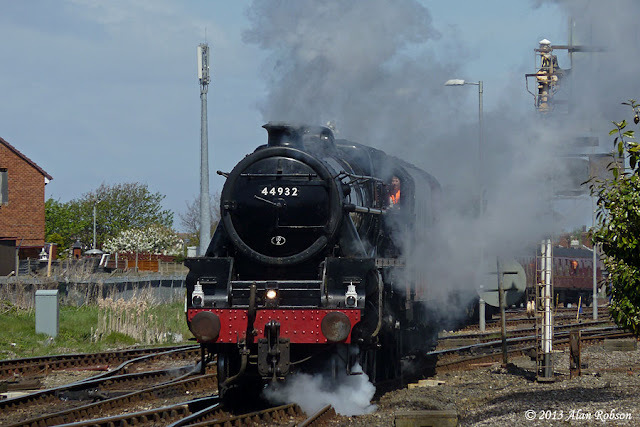 Wednesday 22nd May saw a steam special excursion visit Blackpool North Station. The Fylde Coast Express was run by Compass Tours, beginning from Kilmarnock in Scotland the train was hauled by class 47 diesels to Carlisle, from here Black Five 44932 took over for the rest of the journey to Blackpool. 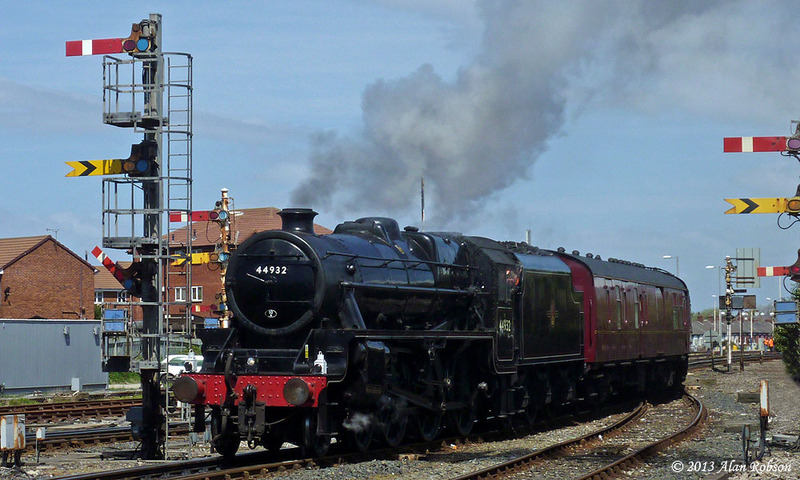 The return trip to Kilmarnock later in the day was hauled by diesel locos 47854 & 47786. 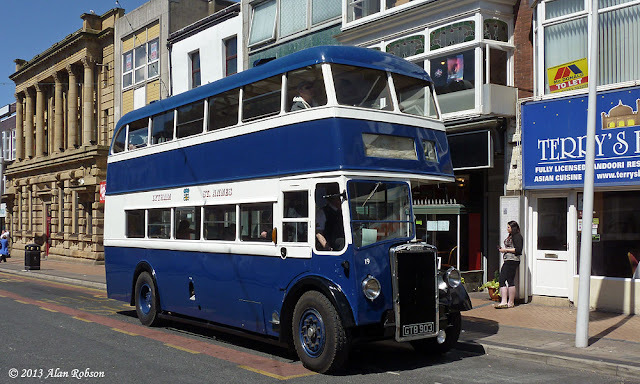 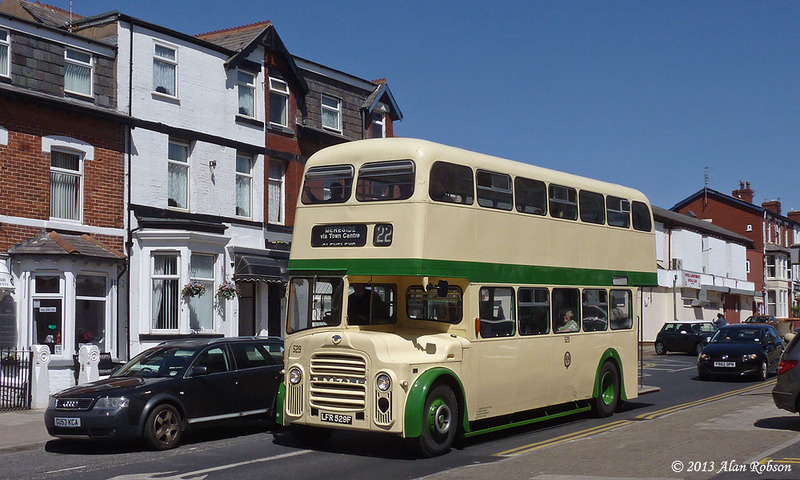 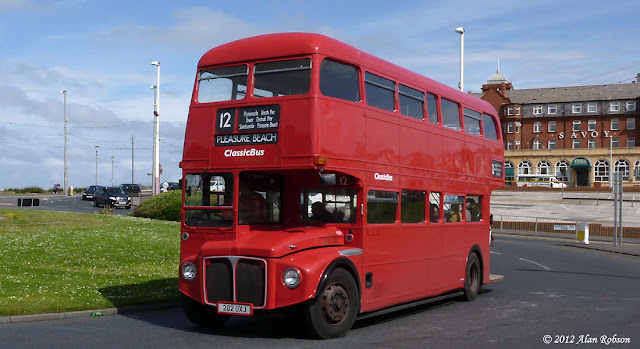 On Saturday 25th May, Classic Bus North West will be taking you on a ride into yesteryear using a selection of heritage buses on its "Catch 22" service operating between Cleveleys and Mereside. 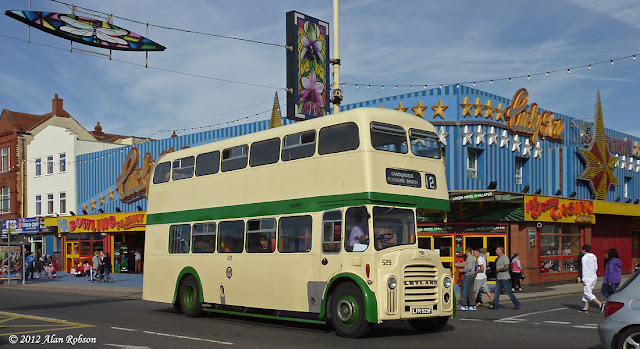 Once more you will hear the cries of "any more fares" and "hold tight please" as some classic buses from Blackpool's past stretch their legs on this 12 mile route. 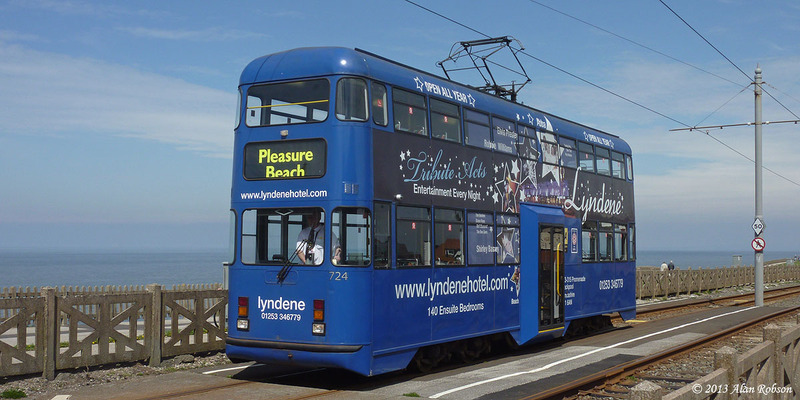 A 1946 ex-Lytham double deck, a 1967 Blackpool PD3 and an iconic London Routemaster will be guest stars on the 30 minute Saturday service and normal fares will apply, including free travel for OAPs and a £4 day ticket for Adults (£2 for under 16s). 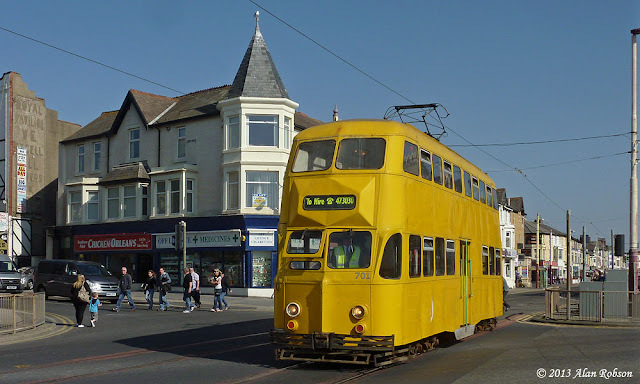 The origins of service 22 date back as far as 1936 when trams along Central Drive and Talbot Road to Layton were replaced by buses. It was progressively extended as new housing was constructed to Bispham and Cleveleys at the northern end, and along St Annes Road towards Halfway House. 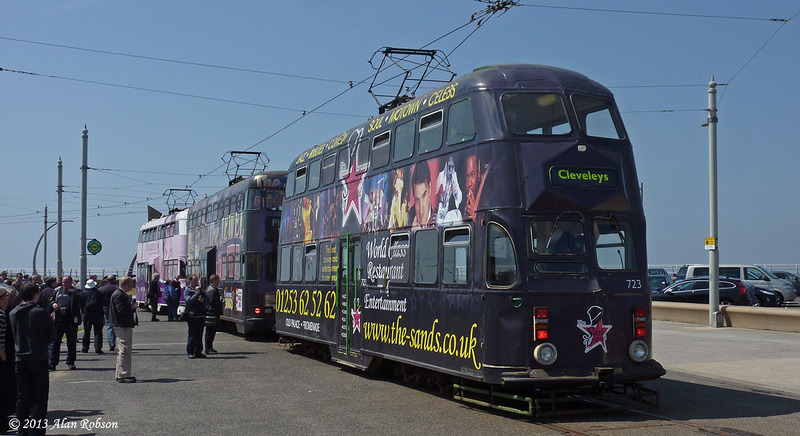 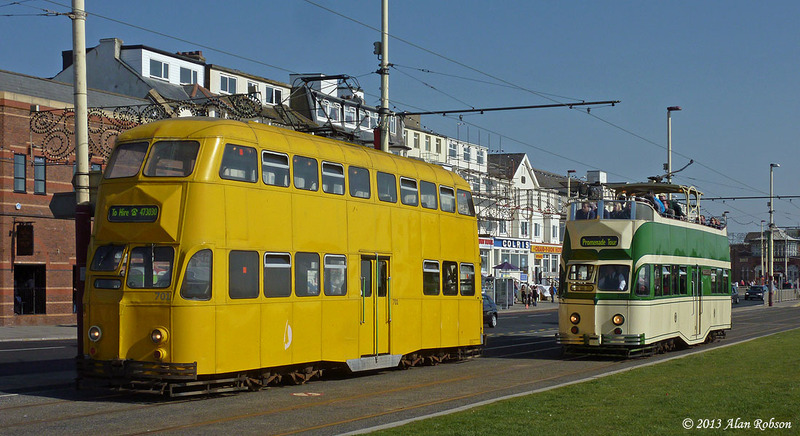 Later still, in 1983, service 22 was extended to St Annes and Lytham, but in 2001 it was replaced as part of Blackpool's "Metro Coastlines" network of simplified high frequency routes. 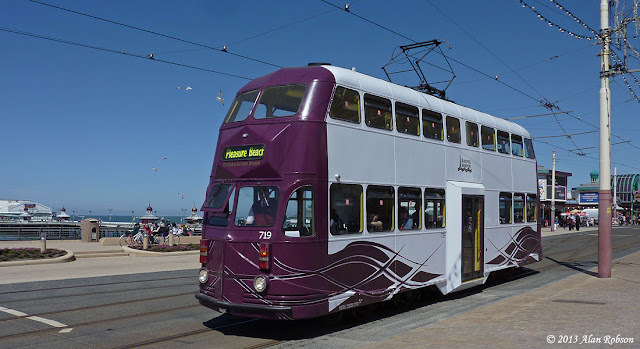 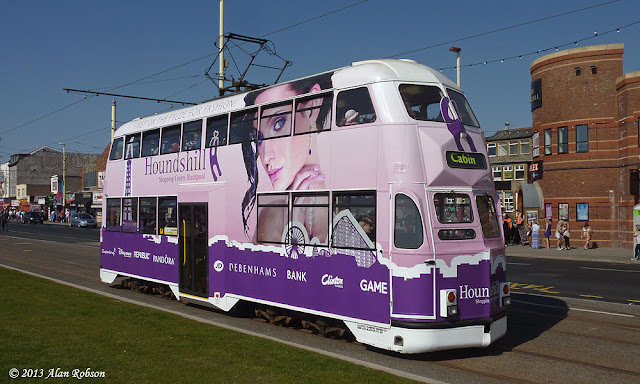 However, in September of last year the service was revived by Classic Bus North West, operating along some sections of the historic route 22, but making some new links not served by existing Blackpool Transport buses. 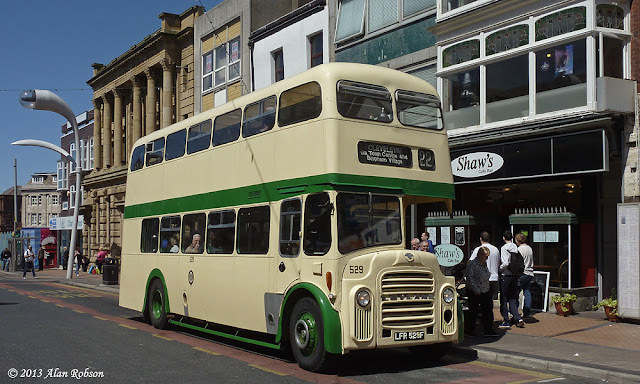 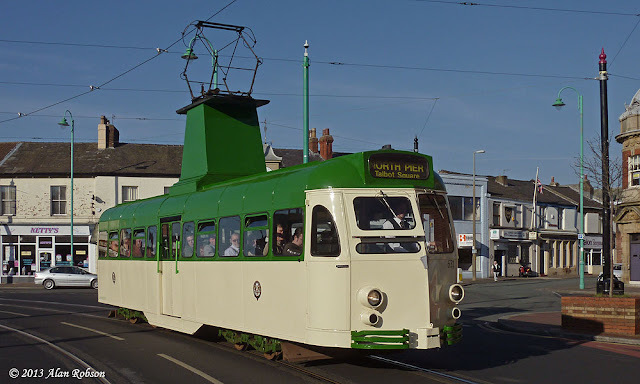 Saturday will be an opportunity to take a trip on the transport of yesteryear and there are already plans to repeat the event in the near future with some other gems from Blackpool's transport past. 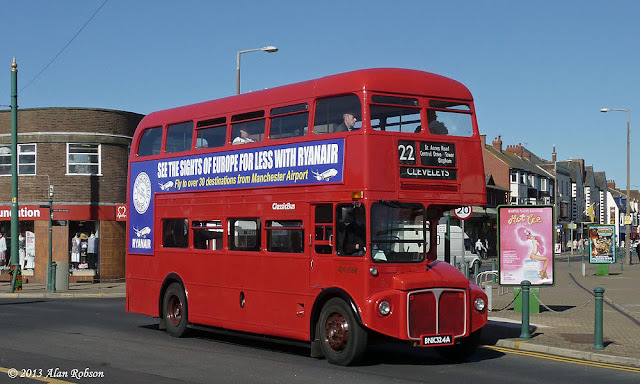 A timetable with bus allocations is available for download on the Catch 22 website. 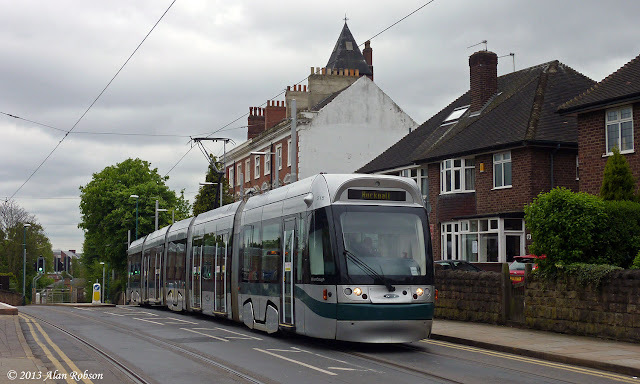 A short visit to the Nottinghamshire area over the weekend afforded a chance to visit the very interesting Nottingham Express Transit system, known locally as NET. 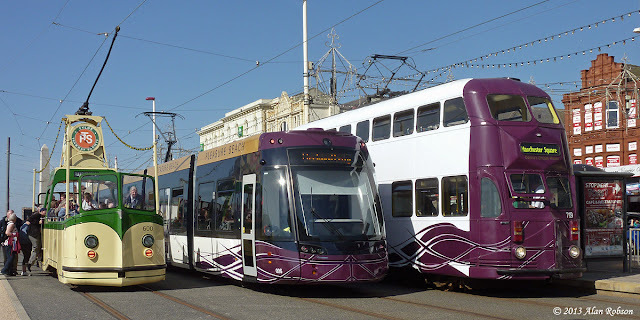 The new tram system began operation on 9th March 2004 and was an instant hit with the public. 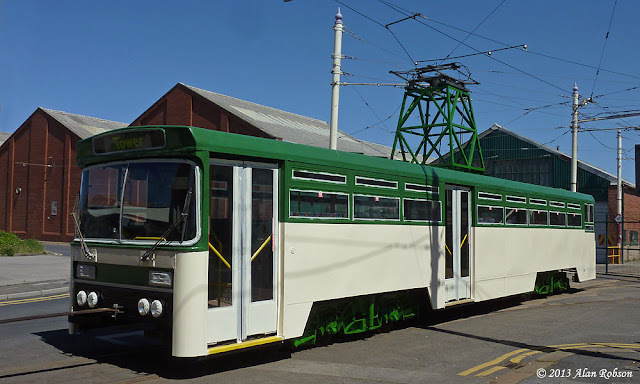 The visit took place during a transitional period, where the existing livery of green, silver and black is gradually being supplanted by a predominantly silver livery with a green band. The system has street track for several miles from the city centre to the beginning of the suburbs where it changes to reserved track, paralleling an existing heavy rail line to the terminus at Hucknall nine miles away, there is also a short single track spur line to a park-and-ride car park at Phoenix Park. The on street trackage is particularly interesting, as a good portion of it is over hilly terrain with many twists and turns, the contrast with the straight and flat coastal tramway in Blackpool being very marked. 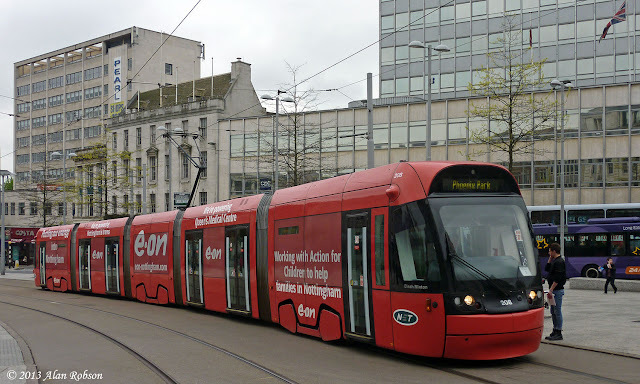 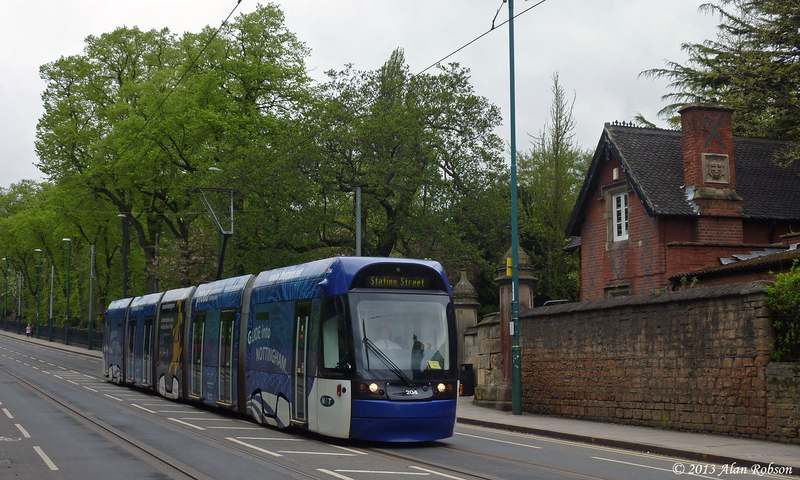 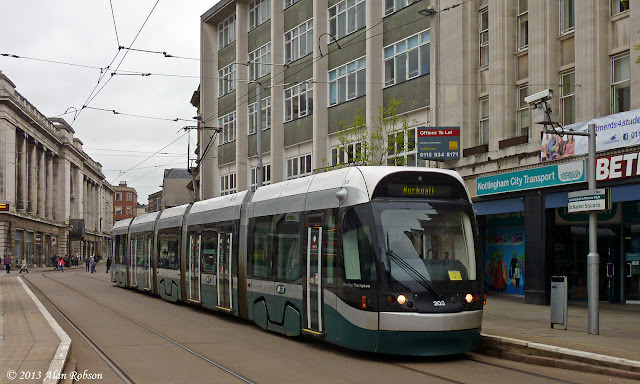 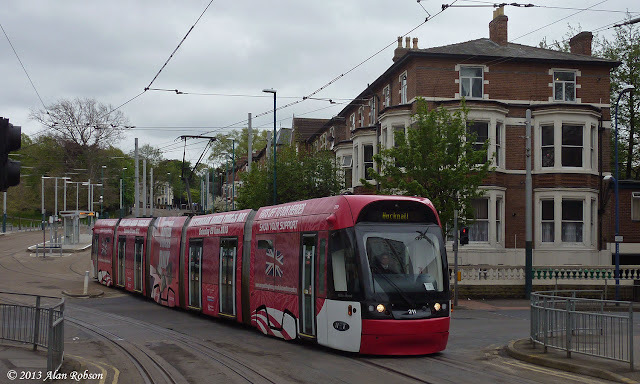 Both systems are operated by Bombardier 100% low floor trams, Nottingham using 15 Incentro AT6/5 models, whereas Blackpool use 16 of the more modern Flexity 2 trams. 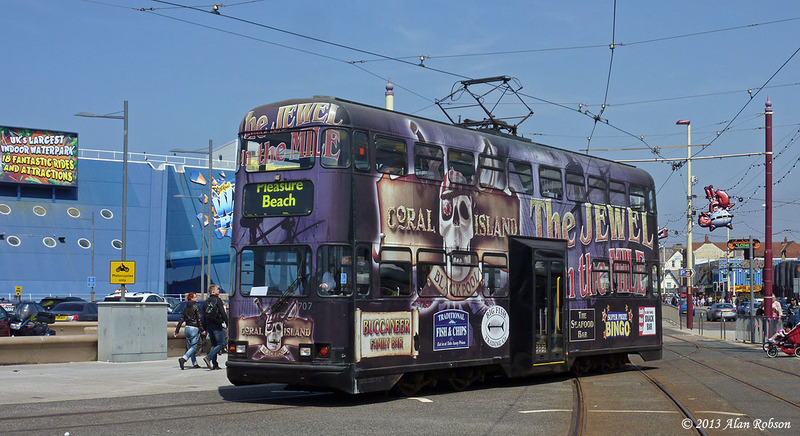 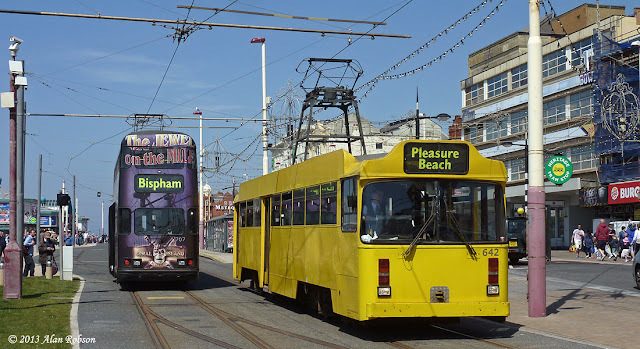 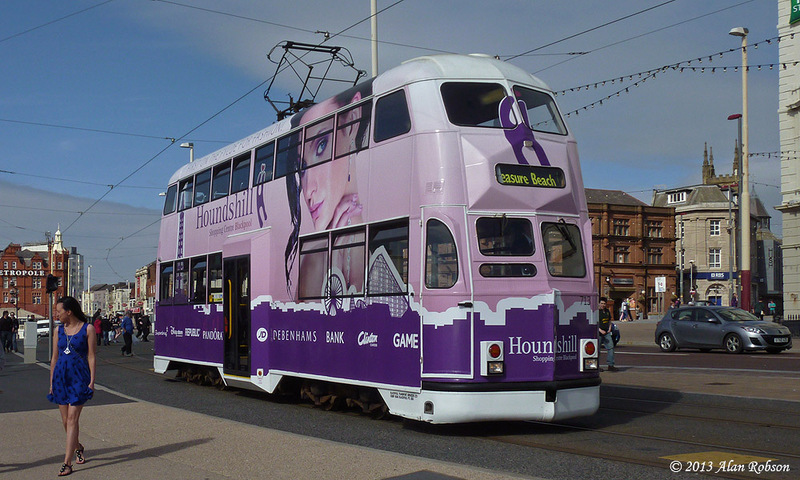 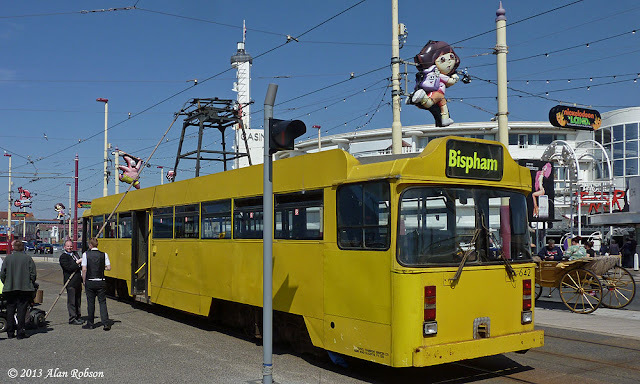 See my Blackpool Tram Flickr gallery for a greater selection of photos taken during the visit. 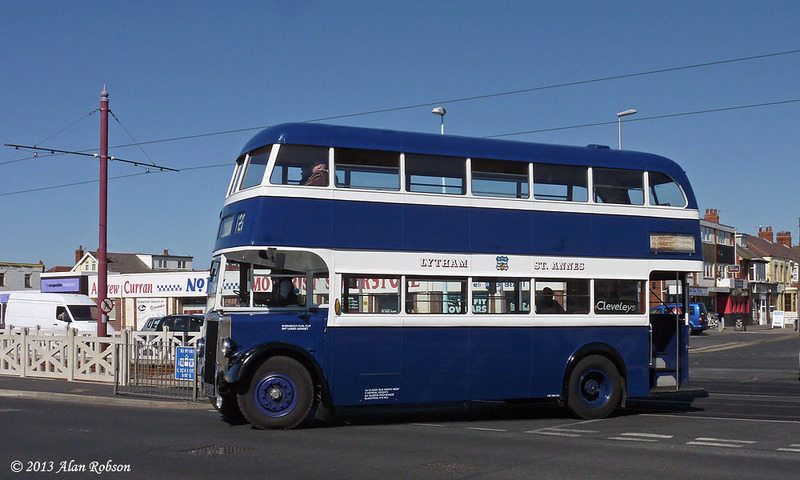 Former snowplough equipped Balloon 701 made the first heritage run of the day to Fleetwood Ferry on 6th May and was also joined on the Heritage Tours by Brush car 631. 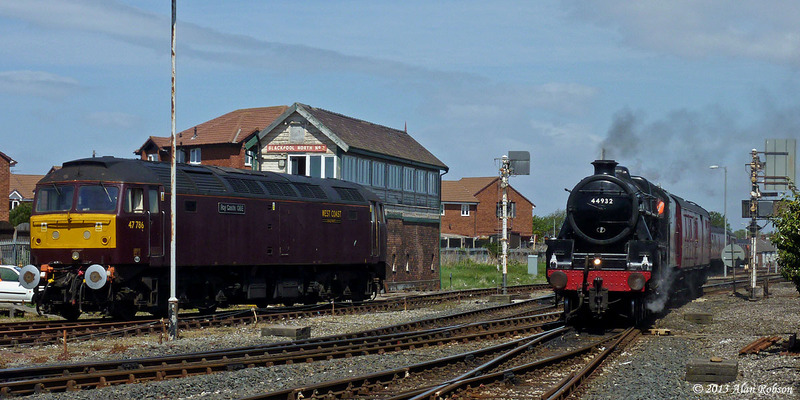 The specials were handled by Balloons 709 and 724 in the morning, with 724 being swapped for 719 during the afternoon. Further tram swaps during the afternoon saw 701 returning to the depot to be replaced in heritage service by Boat car 600, and 719 which was replaced by Boat 230 in order that it could be used for the final round trip to Fleetwood Ferry, duplicating Brush car 631 which was running ahead of it. 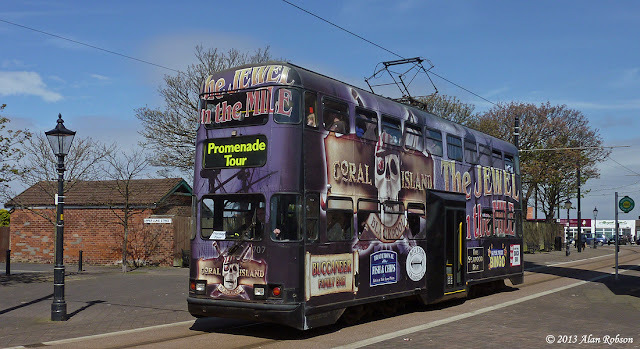 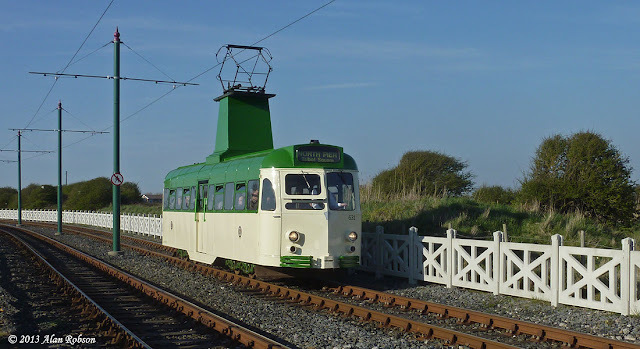 Sunday 5th May started out dull and drizzly, so what better tram to chose to send to Fleetwood on the Heritage Tour than open Boat 230! 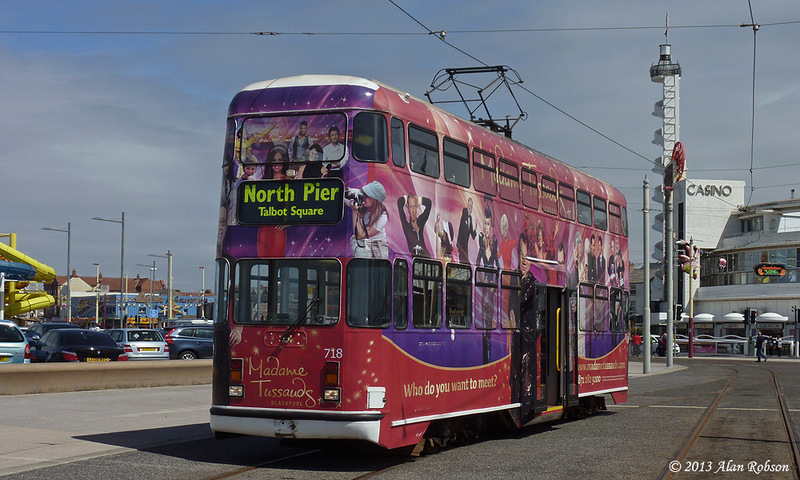 At North Pier the tram soon filled up despite the potentially daunting conditions, 230 then opened the days proceedings with a trip to Fleetwood Ferry and back. 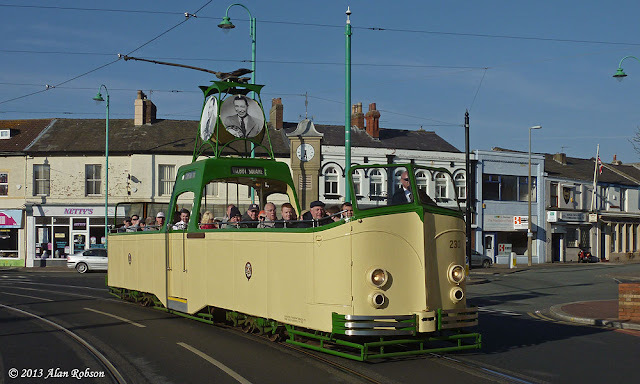 Fortunately by the time that 230 made its second Heritage Tour run, this time a round trip to Bispham, the weather was a lot more more suitable for open boating. Balloon 701, which saw use as the snowplough earlier this year, was the second heritage tram of the day, and remained in all day service until the early evening. 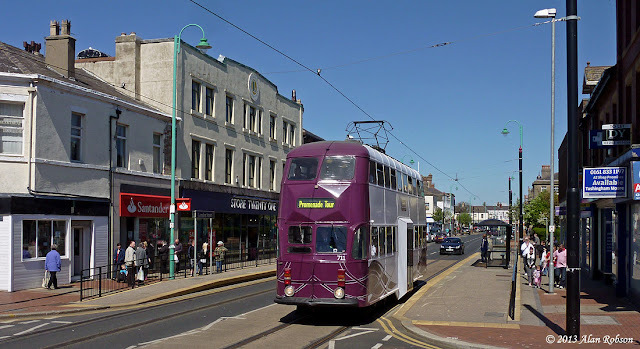 The output of specials on Sunday consisted of three Balloons, flat fronted Balloon 707 on all day specials, similar Balloon 718 on morning specials, and 713 which came out as the afternoon changeover for 718, which returned to Rigby Road depot early in the afternoon. 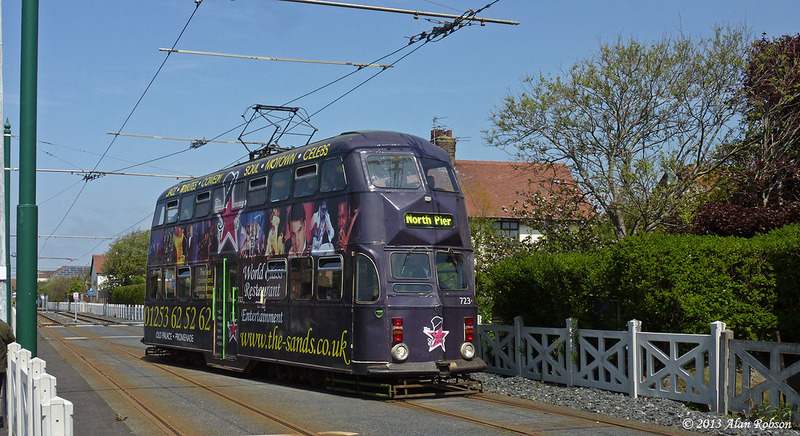 Balloon 707 performed the early afternoon run to Fleetwood Ferry from the Pleasure Beach. 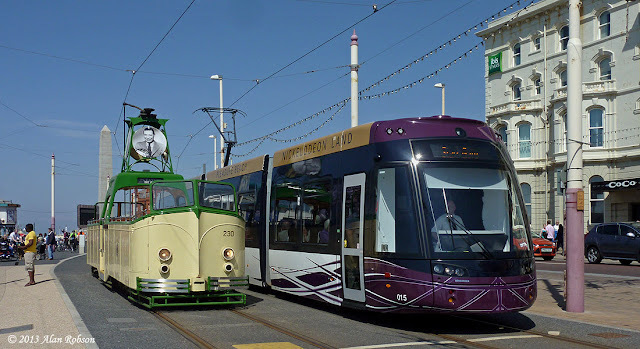 As a result of the positioning of the loading platforms and points on the new light rail system in Blackpool, trams which run as a short working to North Pier have to travel past North Pier to the northbound platform just short of the Metropole Hotel. 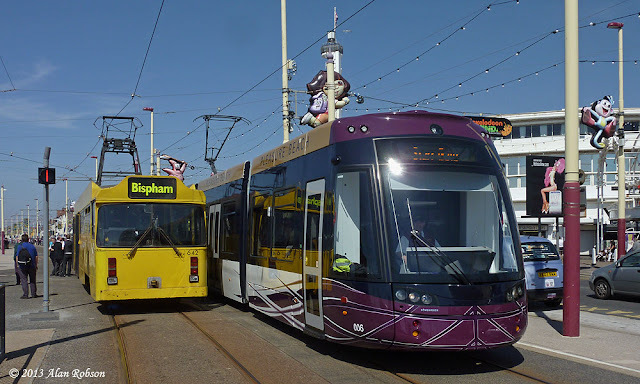 The tram then has to reverse and run wrong road southbound along the northbound line, until the crossover which is south of North Pier is reached. An unexpected substitution took place during the afternoon when Boat 230, which had returned to Rigby Road depot, was replaced on the Heritage Tour service by prototype Boat 600 for the remainder of the afternoon.